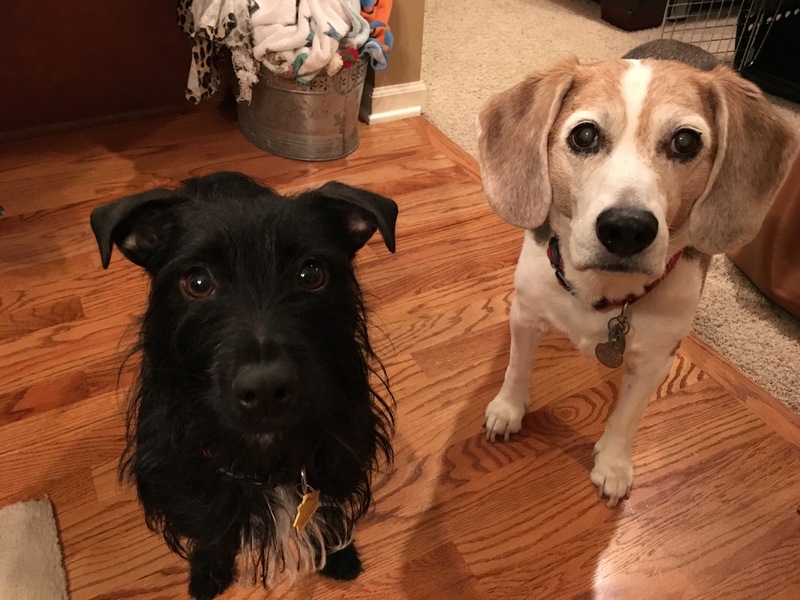 Mannie (pictured here on the left with his room mate Booms) is a one-year-old Jack Russell mix who has separation anxiety, over barks, chews and does not like his kennel. I usually ask my clients to act however they normally do when guests arrive so I can see how I can best help. Unfortunately Mannie’s guardian informed me that he was much more subdued then he normally is for my arrival. While I was sitting down with his guardian to discuss the situation, I noticed a few things that were concerning. Number one was Mannie’s constant gravitation towards his primary guardian, almost as if she was a security blanket. It wasn’t hard to see why he did this, every time he got close to his guardian she reached over to pet him. While I hate to say that petting a dog is a bad thing, we have to be aware of what is going on when we pet a dog. If a dog is an excited, anxious or fearful state of mind and we provide it with attention or affection, we are essentially agreeing with that dog’s unbalanced behavior. Additionally this can give the dog the impression that it has the authority to tell it’s guardian what to do. Over time, this leads the dog thinking that it has more rank or authority than the members of his family. When this is the case, many dogs stop listening or responding to any commands or corrections they don’t agree with. To help change that dynamic, I suggested that the members of Mannie’s family start practicing what I call Petting with a purpose. This involves only providing the dog with attention or affection when it does something to earn it such as sitting, laying down or coming when called. When we emphasize rewarding a dog after it completes one of these three actions, we help change the leader follower dynamic while communicating to the dog that listening to the humans is something that is rewarded. I also suggested that the members of the family incorporate a few new rules such as not allowing the dog on the furniture, asking it to sit before letting it go outside and staying out of areas during specific situations (like when food is being prepared in the kitchen). By introducing and then enforcing boundaries and limits this way, all the members the family can take on more of an authoritative role in the dog’s eyes. After going over these day to day a structural changes, I turned my attention to Mannie’s fear of his kennel. Many dogs develop a fear of the kennel because the only time the guardians place them inside is when they are leaving. When this is the case, the best course of action is to help the dog practice being calm inside the kennel while the guardians are still home. I went over a simple exercise that uses positive reinforcement to change how the dog feels about going inside the kennel. It will take some time and practice, but by asking Mannie to stay inside the kennel for gradually increasing periods of time, he will learn to relax as his guardians are still there with him. Once he has enough practice staying calm inside the kennel, he will be able to maintain this calm state even after his guardians leave. Another issue that I noticed was that Mannie only came to people when he felt like it. Anytime you have a dog that gets rewarded on demand such as Manny was, it’s common for them to think that they can pick and choose which commands they want to follow. After all there were no consequences or rules before that motivated the dog to obey. To further communicate to the dog that obedience is something that is rewarded, I led the members of his family through a simple recall exercise. I suggested that the members the family practice this recall exercise at least once a day every day for the next two weeks. Each time they conduct the exercise I instructed them to move further and further away from each other and also increase the difficulty by practicing in different locations. At first you want to practice the exercise in a single room with everyone a few feet away in a circular pattern. Once the dog gets more proficient at recalling to whoever called him, then they can move further and further apart until people are in different rooms and even different levels of the home. Once the dog has mastered recalling are these carried locations, the next step is to practice the exercise outside. There are quite a few distractions outside, so just like any other skill, it’s important to practice under those conditions. With enough practice, the family members will be able to get Mannie to consistently come to them no matter what the distance or environment entails. For those rare occasions when Mannie fails to listen or is disobedient, I went through a series of escalating consequences and nonverbal communication cues that I like to employ. To help the members of the family practice using these new escalating consequences, I had one of them leave and then pretend to be a guest arriving at the front door. Security of the pack is generally handled by the senior ranking dog. Manny’s behavior at the door was indicative of a dog that considers himself to be in charge of security so it will be very important for his guardians to take over this position in order to complete Mannie’s rehabilitation. Mannie put up a good fight, but within a couple of minutes seemed to understand what his guardian was asking of him using her new nonverbal communication cues. I suggested that all of the members of the family call or text each other when they are on their way home so that they can practice claiming the doorway in the same manner. It should only take many handful of repetitions before he starts to voluntarily stay behind the boundary to the front door whenever he hears someone knocking or ringing the bell. Fundamentally I don’t think that Mannie’s guardians were giving him the discipline or structure that he needed to feel secure and comfortable as a follower. As a result he elevated himself into more of an authority position which caused all sorts of human canine social issues. Now that his guardians are communicating to him in a way that he understands and are taking over the leadership duties, his respect for their authority will grow. By the end of the session, Mannie was deferring to the human’s lead and corrections almost immediately. It’s gonna take a few weeks of consistent application of the new rules, boundaries and limits before Mannie completely turns over a new leaf. But based on how quickly he had adapted during our session, I don’t suspect it will be very difficult for his guardians to get him to learn to be calm, balanced and obedient all the time.